I imagined this post so much it feels more like a memory . . .
Indubitably, I have put off crafting words on this subject for months. I feel need to express it. Yet I know not where to begin. The weight of perfect prose bears down on me. How can I aptly describe the changes wrought in my life from the music, words, and live stage production that is Hamilton: An American Musical? First was the cast album: It trickled across my attention at first, in the background of a busy day. Then in focused measure, I began to listen straight through, nonstop, from opening number to closing notes. For months on end, Hamilton prevailed on my playlist, each cadence cascading down my thoughts at all hours. Second was the change in my thought patterns: Everyday words suddenly triggered rap lyrics, and normal conversation twisted into Hamilton tunes. When the songs weren't enough, I sought out a podcast to dissect the details. Third was the inspiration: I was at a crossroads in life. A decision had to be made. And, silly as it may seem, I kept thinking to myself, "All my life I've waited for it. I've been Burr. Yet is it time to be Hamilton and not throw away my shot?" I took a bold course of action. And while obviously God, family, and friends gave me wisdom and support, I felt bolstered in a small way by the words and characters that had imbedded themselves in my life. Fourth was the trip: Thankfully, I am in good company. My friend Susan and my daughter, Kaelyn, have journeyed into Hamilton along with me. (Even Steve hasn't come away unscathed.) We trio of ladies traveled to Chicago to witness the musical onstage. (Though it is coming to Cincinnati this fall, we were past patiently waiting.) June 7, 2017 it all went down. If you have seen us since then, you will note—we are different now. Story has power. Music has power. Add to that live drama, and you are enveloped. With tears in our eyes and adrenaline coursing through our veins, the three of us were enraptured. I can't wait to see it again. Shared history + raw relatability + catchy musicality + Lin-Manuel Miranda's wording wizardry = infatuation probability. I claim to be a Hamilton victim—ensnared. I'm not even sad about it. Of late, I have had wont to consider the classics whilst I fill my days in respite from my paid labours. And indeed, one accomplishment has already become my treasure—Jane Eyre. My repose was such this week that I had liberty to partake in the reading earlier than suspected. What began as a leisurely activity to bide away my idle time soon changed its course. After some engagement in the narrative, there persisted in me some strange madness, pressing me onward to take hold of the unknown future and compel the novel to reveal its enigmatic ending. I was struck by fatigue on more than one occasion at such bewitching hours when the moon was high and one day turned unto another. Yet I crept forward in enchanting delight, lapping up the strange tale as a ravenous beast, no longer aware of what person or activity surrounded me. As foretold by a confidante, the enrapturing effort ended satisfactorily. Disappointment was far from me, and a smile crept to my face as the last page turned. Surprisingly, God's presence was felt throughout the journey, and His Mighty Spirit spoke to me through numerous passages. Truly, I am a joyous character to have undertaken this pursuit. Harmonies of voices and instruments filled the theatre, flowing through us and rising up to the ceiling. The piano, acoustic guitar, and violin became powerful communicators as strongly as the aching lyrics that completed each song. Wow! Can I say it again? Wow! First off, we sat in the FRONT ROW! I'm talking the front, front row. In this theatre (yes, I like spelling it that way! ), they'd covered over the orchestra pit and put down three additional rows of chairs from the normal front row right up to the stage. Our knees practically touched the stage as we sat there. We were almost dead center. Funny that we didn't have to pull any strings to get such seats. Steve just happened to go online a few minutes before the advertised time that the tickets were to go on sale. These were the seats he was given when he placed the order. We got some amazing pics. I'm posting one here, and Steve's posting the rest on his blog (beitcarr.com). The coolest moment of the night may have been the very beginning. Glen came out alone with his guitar (one he played all night and has played so hard that it has holes in it) and sat down on his knees at the very front edge of the stage, away from all microphones. He then sang "Say It To Me Now," belting out the words, his voice echoing throughout the room. Another highlight: Steve and I both got to interact a little with these artists. Glen was funny in between songs and was telling some odd stories and metaphors for their songs. As he talked, he'd look down to his right, often making direct eye-contact with Steve. Steve made good nonverbal reactions as a good listener should! :) I smiled once during the concert at Marketa (she sat at the piano most of the night) and then at the end as we stood to applaud, I waved and said good job to her and she said thanks in reply. I enjoyed seeing Glen and Marketa interact (see photo). He was fun and silly at times and chatted like he was just hanging out with the audience in a living room; she was shy and introverted (making her performance in the movie even more remarkable). They'd whisper between songs, deciding what to play next. 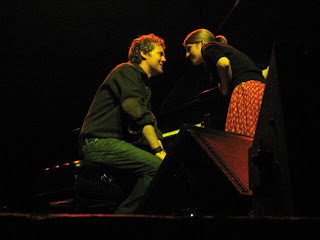 She'd look at him each song for timing -- even songs they've played probably hundreds of times together, such as their famous "Falling Slowly." We'd just heard on a news story about them that they'd fallen in love as they'd played together and made the movie together. That knowledge made it even more sweet to watch them. Such skill was present. Their playing and singing and songwriting was impressive. You could see their passion for music in every move they made. My appreciation for such musical talent and passion has grown over the years, and it was amazing to watch last night.